It’s the story of two friends of his. One was a great tactical thinker who was an incredibly gifted copywriter. The other was a serviceable copywriter, but more of a strategic thinker who kept his eyes on the Big Picture. The tactician went into the cubic zirconium business. He wrote an amazing ad that ran in the LA Times. The ad cost $30K and because he was such a talented copywriter, it was a big success and he ended up pocketing about $6K on the deal. It’s important to note here that he shipped his stones to customers in plain packaging with no enclosures. The strategist also started a cubic zirconium business. He also wrote an ad that ran in the LA Times at a cost of $30K. Though, not being as strong a copywriter, his ad didn’t pull as well. He lost about $2K on the initial orders the ad generated. But he was a strategic thinker. So when he fulfilled the orders, he shipped the stones in a fancy velvet jeweler’s bag inside a simulated wooden box. “Thank you for investing in our diamond. 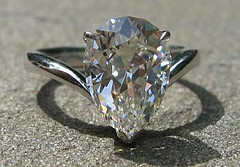 When you open your package and take out your 1 carat stone, 2 things will be evident. The first is that it’s more fiery brilliant than you were expecting. And, second, it’s going to look smaller than you were expecting. But it’s not because we cheated you, it’s because our stones have more density and are a higher quality than most. When our clients see how magnificent their stone is, the vast majority want to order larger ones. And then when they get them, they have another problem…they want to get the stones set but jewelers charge an arm and a leg to do this. …but 15 months later had made $25 Million. That’s the difference between tactical thinking and strategic thinking. I see the stark difference between the two all the time online. Especially when it comes to building and managing AdWords campaigns. I’ve reviewed plenty of campaigns set up and managed by people who have a strong technical understanding of AdWords. But these campaigns fall well short of what they could be because they take the same approach as the tactical thinker in Jay Abraham’s story. They may be great at AdWords but there’s no focus on the Big Picture…it’s all about the immediate return. Those who take the more strategic approach to managing AdWords campaigns produce a bigger pay off in the long run. Because they’re not just focused on the profit from the first sale, but on building the lifetime value of the customer. Because they use the data from the campaign to determine the most successful ads and use that to improve the results in the business’ other marketing efforts. Because they use keyword data to strategically focus their SEO efforts on the keywords they know are going to produce for them instead of taking wild guesses based on incomplete (and often inaccurate) keyword data. Because they use AdWords as a way to build a highly interested list of prospects that can be marketed to via email, direct mail and other channels over the long haul. Strategic thinking vs. tactical thinking. What’s driving your marketing efforts?